Purple Finches and House Finches can be difficult to distinguish. 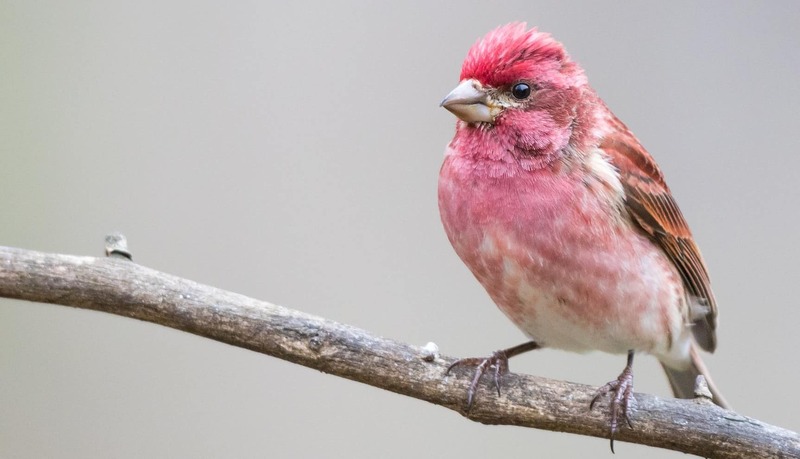 Male Purple Finches are more of a raspberry color than male House Finches which are more orange-red to purple-red, and the male Purple Finches have a splash of raspberry on their wings. Male House Finches have more streaking on their flanks and their wings have little to no reddish coloration on their wings. The female Purple Finch has stronger facial markings than the female House Finch and they are a drab greenish-brown, while the female House Finch is more of a brownish-gray. The tail of a Purple Finch is short with a deep notch, while the tail of a House Finch is longer with a slight notch. The courtship of the Purple Finch is a dramatic display. “At times the Purple Finch seems to be overcome with emotion, and he will launch himself into the air with vibrating wings, rising upward and upward, melody pouring from his throat like a torrent down a mountain side, until he has reached an altitude of 200-to-300 feet, when with outstretched wings he descends in wide circles to the summit of the very tree from which he started. Occasionally this impassioned outbreak comes with such suddenness as to startle anyone who may be nearby. Often he may be seen about his mate on the limb of a tree or on the ground. His crest standing high and his tail spread with the bright feathers of his rump raised in the air.” – “Birds of America”, Volume 3, Pearson, Forbush, et al. 1917). It seems fitting that the little bird “dipped in raspberry juice” is a friend to fruit growers after all!